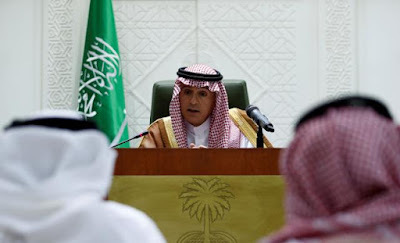 “Diplomatic talks continue ... we don’t want to have poor relations with Saudi Arabia. It is a country that has great significance in the world, that is making progress in the area of human rights,” he said. Her brother Raif Badawi, a prominent blogger, is serving a 10-year sentence and has been publicly flogged for expressing dissenting opinions online. His wife and children live in Canada and are Canadian citizens. Canada’s foreign ministry said it was seeking clarity from the Saudi Arabian government. Bilateral trade between Canada and Saudi Arabia is worth nearly $4 billion a year. Canadian exports to Saudi Arabia were about $1.12 billion in 2017, or 0.2 percent of the total value of Canadian exports.